Each of us has had the experience of being in a desperate situation. Think back to when you believed you were at the end of your rope. "THE END" is subjective. Everyone sees their situation differently. What I might consider "the end of my rope" is not necessarily what you would see as "the end". Pain, emotional or physical pain is perceived differently by every person on this earth. That is what makes us all different. I know of children who have been abandoned by both of their parents, either by death or choice. Yet those children are able to continue on with their life. At one point in my life I was sure that life as I knew it, was coming to an end. My grandmother told me, "When you think you are at the end of your rope, tie a knot at the end and hang on a little tighter." At the time I thought she had no idea how simple that sounded. Today, years later, I appreciate just how good her advice was. I've tied that knot at the end of my rope several times. Sometimes I've actually tied that rope around my wrist so when I got tired of hanging on, the rope would just do the work for me and I could rest and gather my strength to hang on a little longer. I challenge everyone who reads my blog to think about the people in their life who are your rope. The ones you go to when you need some support. The people who know how to make you feel better when you are desperate. This group knows how to help others when they are at the end of their rope. More pictures to join this honorable group as soon as I get my Internet working! When the Cayman Islands Marathon comes round, many charities will benefit from the good nature of runners raising money for good causes. All proceeds from the Cayman Islands Marathon, which takes place on Sunday 7 December, will benefit the Cayman Islands Cadet Corps and the Cancer Society. Race organisers are encouraging runners to consider running for these or any other charities of their choice. “Running in aid of a charity is a great way to motivate yourself and push forward when the training becomes tedious or difficult,” says Rhonda Kelly, Race Director for the Cayman Islands Marathon. Runners can log on to the CaymanIslandsMarathon.com website and make a donation to one of the charities already listed or they can contact the organisers to have a charity added to the list. Then the runner can send an email to friends and loved ones to let them know about his/her intention to run and donations can then be made in the runner’s name to that organisation. Running for charity is very common and last year a few of the Cayman Marathon participants raised funds for local organizations. 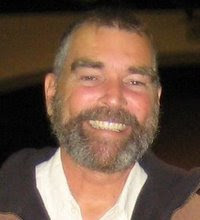 Most notable was Jim Fraser who ran the marathon in aid of the Lighthouse School, raising over $40,000 to be used for building a multi–sensory nature garden for the students, and assisting with the construction of a hydrotherapy pool and Erin Lynch, who ran her very first marathon and raised $2,600 for the Cayman Islands Humane Society’s Spay and Neuter programme. This year, the race organisers are looking forward to meeting a young man who is coming from Haiti to run his very first marathon for a very special cause. Will Perez, 22, is a recent graduate from Brown University who has deferred his first year of medical school to be the new Director of Public Health in Southern Haiti. “My position is unpaid and though I use several grants to fund the work I’m doing, I’m in need of extra funds after the three hurricanes destroyed everything I’d been working towards,” explains Perez. Perez says his training programme has been quite rigorous due to the weather conditions and the conditions of the roads that he has to run on. He has also been training one of the older boys, Fritzner, from the orphanage who he hopes will be able to come to Cayman to run with him. 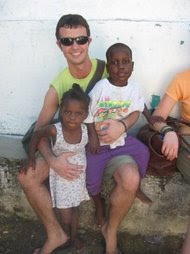 Because Perez’s funds are very limited, he has found a family in Cayman who has agreed to let him stay at their home when he comes for the race and he has started a blog at http://runningforhaiti.blogspot.com/ to keep his friends, family and supporters informed of his progress. 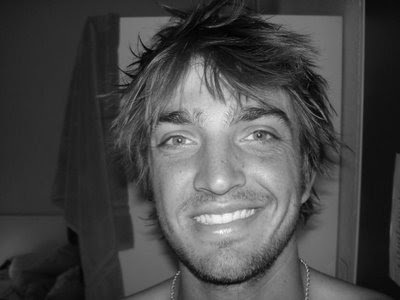 His blog also contains information on how people can donate to his cause. 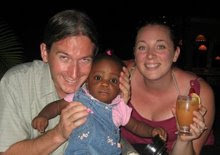 “Will’s story is an inspiring one and we look forward to welcoming him and Fritzner to Cayman and helping them achieve their goals for the orphanage,” says Kelly. Every life is valuable. I am sad for the loss of Mr. Hedi Annabi. I will morn for the possibility of change he could have brought to Haiti. My heart and prayers go out to his family and friends. The chief of the United Nations stabilization mission to Haiti, Hédi Annabi, was reported killed in the collapse of the U.N. building in Port-au-Prince. Mr. Annabi, a 65-year-old career diplomat from Tunisia, was one of up to 100 people reported missing in the collapse, according to the United Nations. Haiti’s president, Rene Preval, told journalists in Port-au-Prince that Mr. Annabi had died when the five-story Christopher Hotel, which housed the U.N. offices, collapsed. Mr. Annabi was meeting a Chinese police delegation at the time of the earthquake, according to reports. On Jan. 7, Mr. Annabi had pledged that the United Nations would assume responsibility for logistics and security for a pair of upcoming Haitian elections. The first, for the country’s legislature, was scheduled to occur on Feb. 28. “Success would allow the country to enter a virtuous circle where stability and development are mutually reinforcing,” Mr. Annabi said. Mr. Annabi was appointed in 2007 as head of the stabilization mission, which includes 7,800 U.N. peacekeepers. He was previously assistant secretary-general for peacekeeping operations, working on U.N.-brokered political settlements in Cambodia and Africa. Once more risking the chance of making some of my friends a little mad. As well as hoping that some of my other friends/family might take note of my issues and mention to someone, somewhere that SOMETHING needs changed. I'll think out loud for a moment... This is Hedi Annabi. He is the U.N. Special Representative and the leader of the four-year-old mission in Haiti. Mr. Annabi may be speaking out of both sides of his mouth. May. I repeat may. I will be waiting to see. One side: President Rene Preval has called on the force for more than two years to provide long-term assistance with "fewer tanks and more tractors." Hedi Annabi believes it's not his mission. He said, "I'm not going to ask for something that will never happen. We try on the margins of the mandate to do what we can, to do simple things for people to meet emergency needs ... but we don't have a development mandate and never will." 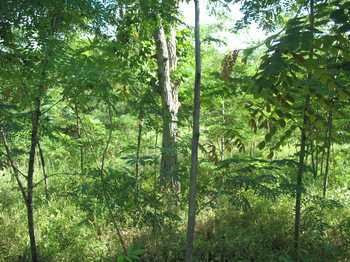 The other side: He believes a large-scale reforestation combined with an alternative energy plan is necessary. He admits the government of Haiti does not have enough resources (aka MONEY) to help the people of Haiti and "A poor, angry and desperate population is not compatible with security and stability. " "I realise we are in a difficult environment," he said. However, he said it would not hurt the economies of developed countries to hand over more aid for Haiti. Is he asking for more money for MINUSTAH? They have a $575 million budget. Or is he asking for "fewer tanks and more tractors"? Water seems to always be the topic of conversation! I write so often about water! 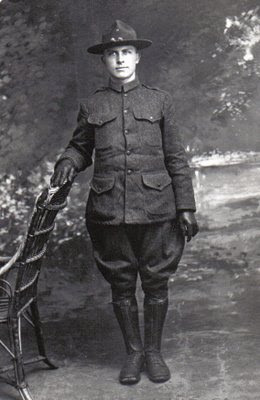 My grandfather who was born in 1896... Picture above, standing proudly in the Army during WWI, worked as a water driver. He drove water to the front lines during the war. Grandpa Smith knew how important water was. After the war, he homesteaded property in the Midwest. I was just a child and remember him telling about "witching water". He believed he was a dowser and many of the people within 3 counties called upon his services to locate water on their property. On his little 20 acres he drilled a well, the deepest well in the county. He would say "this water comes from Mississippi bedrock". Now I don't know if it did or didn't but I still drink from that very same well drilled many years ago. It's good water! Grandpa was an old man and I found him quite silly many times in my life, particularly when he said, "Mark my words someday you'll be paying to drink water." Yes indeed grandpa I now pay for my water. I've written about the lack of water, dirty water, flooding waters and now I write about a lake full of water. This lake is rising. Rising at an alarming pace. It's not just the most recent rain that has caused this problem. It has been on the rise for a few years. Is there ANYONE out there that can help? Can ANYONE offer some suggestions? The houses below, just a couple of years ago did not have water flowing in their front doors. There is NO WAY to move the houses. Soon the lake will overcome many homes. The homes will be lost. If you or anyone you know can shed some light on this issue, if you or anyone you know can do something about this issue, please contact me. If you can't do anything about the water, you can pray. Pray the UN adds this issue to their list of operations before the houses are swallowed up by the lake. Please contact Sherry or myself if you can offer any help. Just a brief announcement. Today my son joined the Navy! Go United States of America! Go Capt. Fernandez "Frank" Ponds! 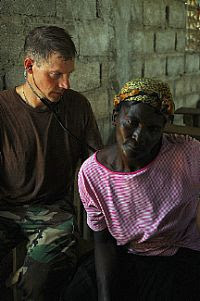 Captain Ponds stated there are "boots on the ground" in Haiti. I personally would like to thank the United States government, the United States Navy, Captian Ponds and all of the men and women on the ground. This is Continuing Promise 2008! We don't read about the good things very often so I'd just like to point out that men and women from the USS Kearsarge were on the ground in Port au Prince, Morase, Calase, Bainet, Trois Ponts, Grand Saline and Belle Anse and I am sure many others cities, towns and villages. They were delivering the 1,130 metric tons of relief supplies, including 29,550 gallons of water to devastated communities isolated by damaged roads and bridges. 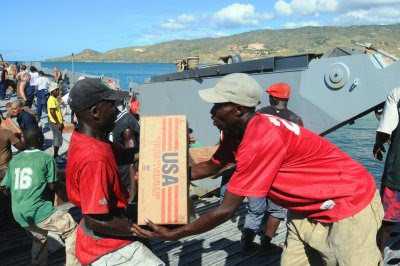 The areas needing the most immediate assistance have been in support of and prioritized by U.S. Agency for International Development's (USAID) Office of Foreign Disaster Assistance (OFDA). Medical teams from Kearsarge, including embarked personnel from Canada and the United States Public Health Service, continue to work with other agencies working in the country - including the Center for Disease Control, Doctors Without Borders, the Pan American Health Organization, the United Nations and others - to provide limited medical services. Air Force engineers and Navy Seabees continue to conduct assessments in some of the more heavily damaged areas where roads, bridges and critical infrastructures were destroyed by heavy rains and flooding from the storms.Kearsarge embarked personnel include service members from the Navy, Army, Air Force, Marines and Coast Guard, along with medical personnel from the U.S. Public Health Service, Canadian Army and Air Force, Brazil, Project Hope and International Aid. Any U.S. military assistance to a foreign nation must be requested by the host nation through the U.S. ambassador. Then, as the lead federal agent, USAID's Office of Foreign Disaster Assistance fields the request and asks the Department of Defense for military assistance, if needed. Why do I write about such things? Because the people of the world are good and I want to say thank you. Licia, the wonder woman I've talked about before... you'll remember her, she's the person who makes me look at numbers different. 1-3 I waited and waited and waited for God. At last he looked; finally he listened. He lifted me out of the ditch, pulled me from deep mud. He stood me up on a solid rock to make sure I wouldn’t slip. He taught me how to sing the latest God-song, a praise-song to our God. More and more people are seeing this: they enter the mystery, abandoning themselves to God. Why are her feet so muddy? Was she just posing for the camera? One hole in the ground. What do you believe is in that hole? What in the world could Lucia be thinking now? Oh, I've got it. You are going to put that water in a bucket to wash your feet? What's that in the bucket Lucia? One cactus? You put a cactus in the water? To make it cleaner? You think that's going to work? You are going to strain that yucky water through 2 towels? NOW you have to give 60 children a bath with that water? Now you filter the water so you can drink it? Just how much water are you filtering 1 gallon at a time? 330 gallons of clean drinking water a day? Lucia, why? Why are you filtering water? Click here to find out why Lucia is filtering water. 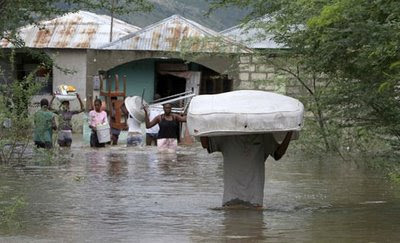 PORT-AU-PRINCE (AFP) — More than 500 people were found dead in Haiti as international aid trickled Saturday to desperate residents who have not eaten in days since the latest in a battery of storms crushed the country. 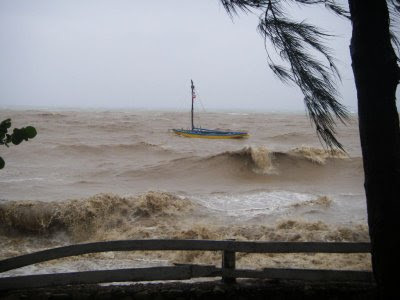 As the death toll jumped nearly five-fold in the wake of Tropical Storm Hanna, the poorest country in the Americas faced a likely new beating from Hurricane Ike, which strengthened to an "extremely dangerous" storm and threatened to dump heavy rains on Haiti's vulnerable northwest coast. And more deaths could emerge. "The toll is increasing hourly," warned the United Nations' Office for the Coordination of Humanitarian Affairs (OCHA). "According to information from the government we have reached more than 500 deaths" following Hanna, which hit Haiti early in the week. The UN Children's Fund warned that 650,000 people have been affected by the flooding, including 300,000 children, and that key bridges have been washed out or blocked leaving many of the country's roads impassable and complicating the task of humanitarian groups trying to deliver crucial aid. 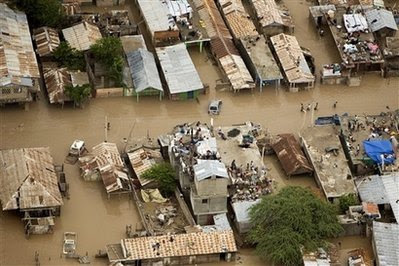 Ground zero of the devastation was in Gonaives, a flood-prone northwestern coast city where about 3,000 people died four years ago when it was drowned by Tropical Storm Jeanne. Senator Yuri Latortue, who represents Gonaives, said 200,000 people have not eaten in days. 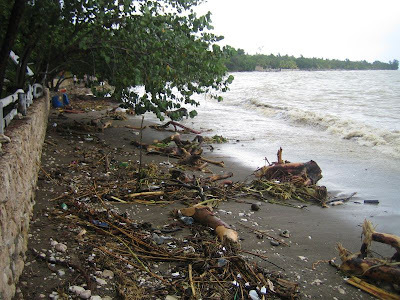 Massive deforestation has left Haiti vulnerable to flooding and mudslides. After Hanna struck, many residents took refuge on the roofs of their homes before they were rescued by UN helicopters. From the air, the rivers were muddy brown as they spilled over into entire villages. Only the roofs of homes could be seen. Blue-helmeted UN peacekeepers on Saturday were evacuating several thousand residents from Gonaives, a civil protection official there told AFP. "The problem is that there are not enough shelters to house all these people, thousands of whom need to be evacuated," the official, Youdeline Joseph, said. Kone Amara, the Haiti humanitarian assistance coordinator for the aid organization Oxfam, said the situation in Gonaives, a city of 300,000 people, was "very grave." "There's no food in the city and people live in shelters with precarious hygienic conditions," Amara said. The aid group had planned to ship 2,000 bottles of water with the help of the World Food Program, but it could not get a boat until at least Monday, he said. Oxfam might take aid by road, but it wants to be escorted by the UN peacekeeping mission due to security concerns. "The people on the road feel abandoned and don't want all the aid to be focused on Gonaives," Amara said. Parnell Denis, the contact for Oxfam in Gonaives, said the city was "completely devastated." "The streets are lined with groups of people walking through the streets trying to find higher ground," Denis said. "Food supplies and water are scarce and the price of the food that's left is rising. 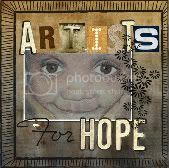 The morale of people staying in the shelters is so very low; I am afraid to tell them that another storm is on its way." 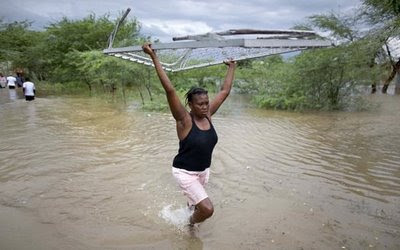 Hurricane Ike was forecast to pass north of Haiti, sparing it from a direct hit, but it strengthened Saturday to a Category Four storm and was expected to lash northern Haiti with heavy rains, according to the US National Hurricane Center. "They will still get pretty strong winds and rain... as well as the Dominican Republic," NHC forecaster Cristina Carrasco told AFP. A tropical storm warning was issued for Haiti's northern peninsula. Radio alerts urged residents to take precautions as the storm could strike on Sunday. Ike, now an "extremely dangerous" hurricane energized with winds of 215 kilometers (135 miles) per hour, was bearing down on Turks and Caicos and the southern Bahamas Saturday and was forecast to rage across Cuba late Sunday or Monday before heading towards the United States, the NHC said. 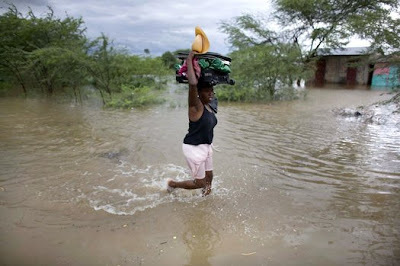 Haiti was already hit in recent weeks by two other storms, Gustav and Fay, which left nearly 120 people dead. OCHA said it would issue an appeal in the coming days for urgent financial aid to help 600,000 people over the next six months. In Brussels, the European Commission has launched "fast-track" aid action for two million euros (2.9 million dollars) to provide relief for Haitians. Brazil, Canada, France, Spain, Switzerland, and the United States are among the nations whose governments have committed relief aid for Haiti. Michele Pierre-Louis, Haiti's new prime minister who was approved Friday to take office after four months of political standstill, now will have to manage a grim humanitarian crisis. 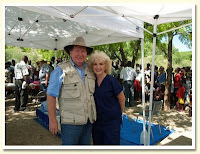 The following (with a few parts removed)is a news letter from my friend in Haiti. For the first time ever, I went out to our beach this morning and found it littered with tree-sized driftwood. Hurricane Hanna was supposed to be a tropical storm that lightly brushed Haiti's north coast but Monday afternoon it moved south, and it's been hitting the country with rain and wind for the past 36 hours. Here in Pierre Payen we've had 12 inches so far. We drove around the local area early this morning to see some of what happened and both the Montrouis and Pierre Payen rivers went well above flood levels. In Pierre Payen a number of people had the river flowing through their homes and one house I saw had all four walls washed away. The Montrouis river Tuesday morning. The Pierre Payen river Tuesday morning. A local home under water. Clean Water for Haiti is fine, except for a few broken branches. One of our workers had a boulder smash through the side of his house while he was sleeping, but I'll get to that later. 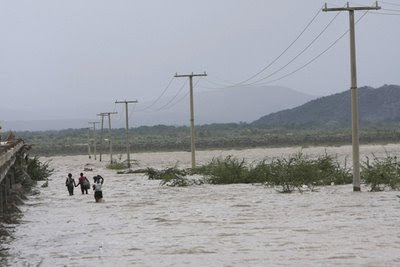 The real tragedy of this storm is probably Gonaives. I say probably because there's no information in the media about Gonaives yet. Word of mouth is that the water went up to 12 levels of blocks, or about 8 feet. 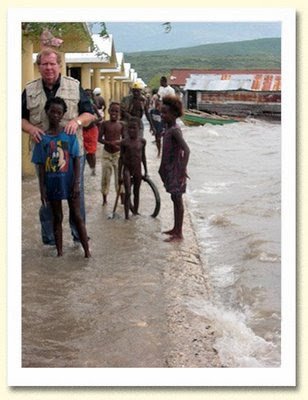 Some of you may remember reading about Hurricane Jeanne in September 2004 which flooded Gonaives last time around. Never before in living memory had so much water come into the city. 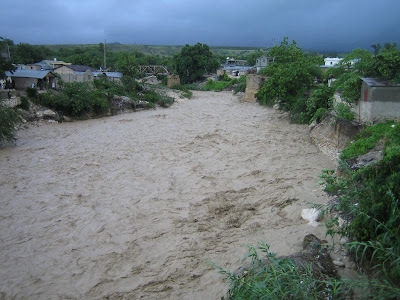 There are three rivers that merge in Gonaives before flowing into the sea, and all three watersheds received torrential rains, combining to wash away over 2900 people and flood the homes of over 100,000 people. Just south of Gonaives there is a lowland depression several kilometers across which was mostly scrub brush and tall cactuses. After the flood, it remained submerged for over a year. Clean Water for Haiti brought in over 3000 filters to Gonaives in the months following the flood which were for the most part well received. 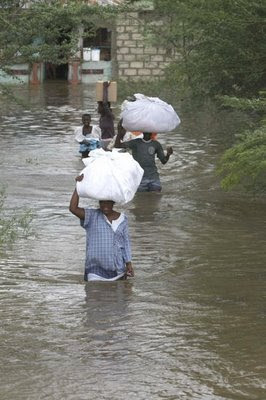 Gonaives is a city with no sewer system and every well and every latrine were filled up with floodwater and mud. Thinking of that disaster repeating itself a mere 4 years later makes me feel queasy. Saint Marc was also flooded but I have not yet seen the damage. 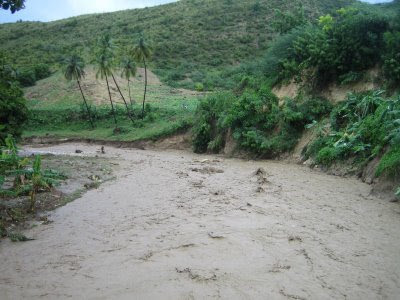 There is very little traffic on the national highway today, and the road to Port au Prince has some very muddy places. I don't know if Saint Marc is passable, and Gonaives may only be accessible by large trucks. 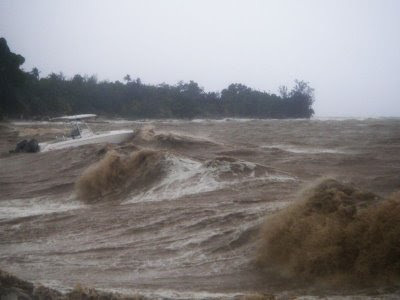 In 2004 we were able to get there in our Daihatsu truck but my feet were underwater as we drove through the deep parts. Biosand filters are poorly suited to disaster relief. The best potable water effort after Hurricane Jeanne was up and running in days, by Oxfam if I remember correctly. They had big, diesel powered reverse osmosis filters that provided enough drinking water for the whole city, free. Biosand filters weigh 160 pounds and go in people's homes. They are a development tool, not a disaster relief one. However, it is so hard to know about people suffering without doing something to help. If I can figure out a way to effectively help people in the flood affected zone, we'll do it. If any of you are working in an affected area and are able to coordinate getting filters to those who have no access to drinking water, please contact me. We have about 200 filters ready to go at the moment. Michel, one of our newer workers, dropped by here this morning and I overheard him saying "Roche tombe su kay la, tet chage. M'pa ka fe anyen, map degage." literally translated, that's "A rock fell on my house. My head is loaded. I can't do anything about it but I'll make do." I asked Michel if I could survey the damage, and we took a look. Well, a rock didn't fall on his house, it was a BOULDER. The house is quite modest - a mud and rock affair perched on a hillside. Michel was dozing on the home's one bed with his child and the boulder rolled down the hill and smashed through the wall of his house, throwing him and the child off the bed. It seems Michel is a master of understatement, something I have solid respect for. Michel also impressed me Tuesday morning by being the only one of Clean Water for Haiti's workers to show up for work - sharp at 6am. I told him we were taking a hurricane break! 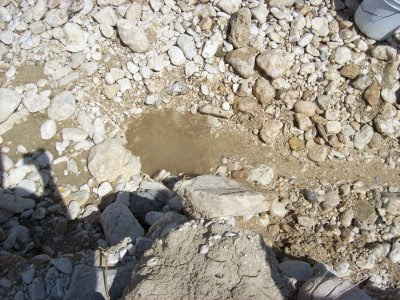 Outside Michel’s house – the boulder that hit his house is behind this second one. The surf became really high yesterday. Our old boat (which now belongs to a friend of ours but is still moored in the same place) became swamped and sank. No waves came over the wall, but they continue to come right up to it. The old mission boat bobbing in the waves before it went under. What the water in front of the mission looked like at 10:30 am on Tuesday. I mentioned about the driftwood - it's remarkable to have driftwood here because any unwanted wood is immediately cut up and processed into charcoal. I suspect that all the driftwood will be claimed within the next few days. As I watched the swollen Montrouis river this morning, large branches and even whole trees went rushing past every few seconds. Please pray for Haiti as the storm rages on, even if you don't normally do that. There's another storm, Ike, on the way and it's predicted to reach category 2 before it brushes Haiti as opposed to Hanna's 1. I can't imagine it being worse, but praying is still a good idea. We're thankful that all of our own people and equipment are okay, and especially for our new roof, which doesn't leak a drop. LATE EDIT: On Wednesday evening the Montrouis bridge started to sink. The Montrouis bridge is the only connection for a good part of the country between the north and the south. If the bridge goes out we are essentially cut off from the capital where most supplies come from. Hanna has affected all of Haiti, not just a specific area. Please keep everyone here in your prayers. This is the second time I've written a blog about water, water and none to drink. 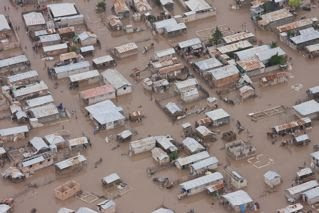 Haiti is still flooded with people sitting on the rooftops waiting for help... which most likely not come. 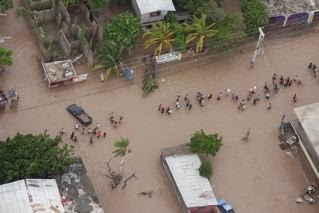 Please keep praying for Haiti. 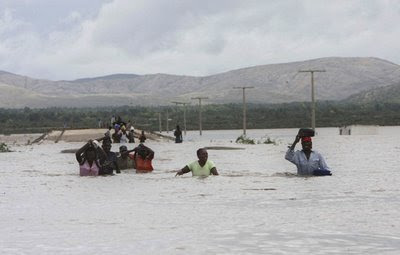 *Gonaives, Haiti is under water. *Floodwaters swamped a hospital in the Les Cayes area, forcing nurses to move patients to higher floors. Please pray help arrives soon. There is this guy, Mark... he's pretty funny actually. He is helping a bunch of kids in a far off land. He posted this cute picture on his blog and since I am a "farmer" of sorts myself. I got a kick out of it. They cut their legs off so they can't get away. Oh Mark you are one funny guy! Check Mark out at his blog. This song is so fun to sing with little children because, long before they are able to remember the words or how the tune goes... they remember the body motions that go with the song. You start singing the song and they automatically start the motion. Fun, fun, fun. Missionary Bobby Burnette says, "Love is not something you just talk about love is something you do." So "DO" sing this song with your children and grandchildren. You'll be happy when you see your little baby praising God, even before they are old enough to talk. 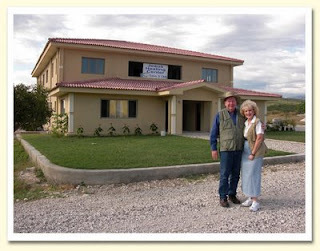 I mentioned Bobby and Sherry because they are missionaries in Haiti and they like to "do". Whether they are building churches and schools, like this one in Le Tant, or holding a mobile medical clinic in a mountain village, Love A Child works every day to help the people of Haiti. In Le Tant, we are building block houses for poor families and individuals to replace mud and stick huts. 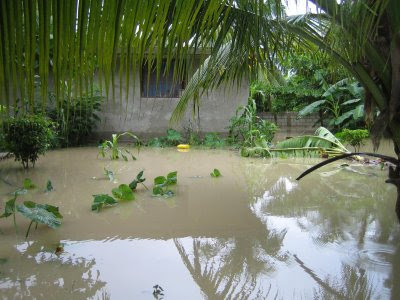 In Fond Parisien, we built a fish farm near our orphanage to provide fresh tilapia. We dig wells and distribute seeds to farmers, we even raise goats! See... you knew somehow I'd get back around to goats didn't you!!! I do love my goats! Matthew 4:19 Then He said to them, "Follow Me, and I will make you fishers of men." I just joined Kiva and it was more fun than shopping on E-bay! First go to Kiva.org, at the top of the page you'll see register. Click on that. Sign up to become a member. Next - click on View all entrepreneurs. Now, just take a look at the groups in front of you. There are groups from North America, South America, Central America, Africa, Asia, Middle East and Eastern Europe. The groups or individuals are people - REAL PEOPLE who need loans. The reasons for the loans are many. Some are building their business, some are buying stock and inventory, some are wanting to buy an ox. An ox? Yes, an ox. You know, the kind brown, four legs, moos, gives milk sometimes, carries heavy objects. Every one on Kiva is a deserving individual who wants to borrow money. Scroll down the list and find someone you can lend money to. Eugenia, the group leader, has five children, ages 2, 6, 7, 11 and 16. She lives in a batey (which is a very poor community) of Haitian families in El Seibo, Dominican Republic. 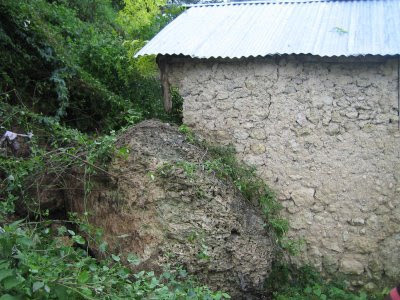 Families that live in bateys have small houses generally made of scrap tin and wood; the best possible accommodation is a cement-block house. These ¨houses¨ consist of only one room where the whole family lives together. 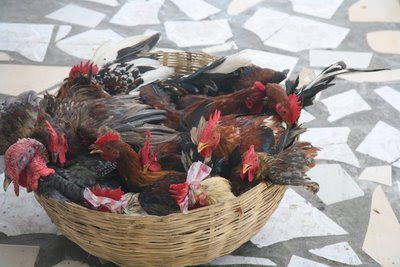 To provide for her family, Eugenia has a small business killing chickens and selling their meat in neighboring bateys. In order to travel between bateys, Eugenia pays a small fee to ride on the back of a motorcycle. By receiving loans, she and the other members of the Bank of Hope are better able to survive the economic fluctuations and frequent sicknesses that make work hard and volatile. 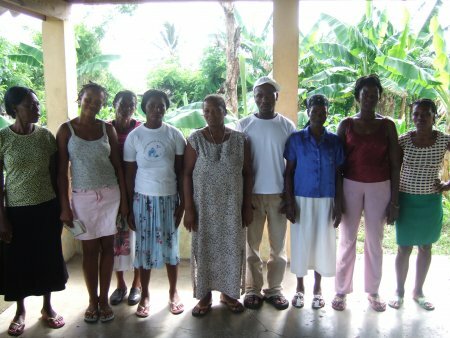 With this next loan, Eugenia hopes to further grow her business by buying more chickens and travelling to more bateys. Someday she dreams of owning her own house. Eugenia also wants to be able to provide the best for her children, including a good education, so that they will have a bright future. He's a Navy guy! (Don't you just love men in uniform? Of course I'm a little partial because my son is in the service... November 2008 update. BOTH of my sons are in the Navy!) Marc Boisvert has inspired enough people to raise enough money to buy over 100 acres, built two schools, an orphanage and a soup kitchen. In my opinion, he is the poster child for "CAN DO". I write this blog every day hoping to inspire you to find a cause. Any cause. I think because we are humans and are always - always- always questioning power! Any power, be it your boss, your spouse, your government or your God. We question always WHY. I bet you are sitting there wondering to yourself, why does she want me to have a cause? Here is why...I want you to just take it for granted that Matthew is telling us the truth and giving you the reason why you need a cause. Who's Matthew you ask? Well he's a tax collector and as Forest Gump would say, "That's all I have to say about that." When God is ready to judge all of us we will be judged equally. Everyone will be asked the same questions and God will save those who have been obedient. If you read Matthew's words you will know that without a doubt those who have fed the hungry, welcomed a stranger, given clothing to the naked and cared for the sick and those in prison. Will be saved. Father Marc has a cause and he didn't sit around wondering why. Do you want to know why he knows the first name of over 600 children?Do you want to know why he knows them? Hmmm.... he doesn't ask why... he provides over 1,200 children with academic and vocational educations and manages to see to it that 3,000 meals are prepared and served daily. 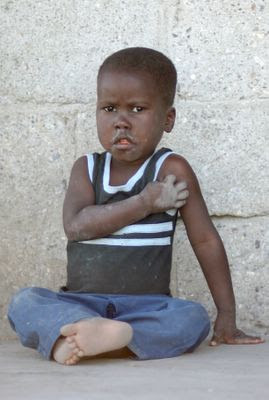 This is a photo of a little boy I saw this morning in a run-down orphanage not too far from here. The 65 children there have no beds, no extra clothes, and most do not go to school. The director of the orphanage has sold all his worldly possessions in order to buy food for the kids and it is almost all gone. These children need your help. Please pray that some generous persons respond and provide these poor children with the hope for a better tomorrow. Maybe that generous person is you or someone you know. Pray, pray for these children of God. When I read what he wrote, I was so amazed. He wasn't asking why this was happening, he was just asking us to pray. He didn't think, "Gosh I should pray for my own work........" He prayed for the orphanage that was failing. Isn't it just the greatest thing, that when you pray, you don't only have one prayer? You are allowed to pray for as many as you want and the prayer you gave away, won't take away from your prayers! Your allotment of prayers will never run out. I've found infact, the more I pray, the more I have to pray about! Back to who has inspired me today. Father Marc. His children live at Hope Village. Please take time and read his blog because if I can't inspire you to find a cause, I have faith that he can. I believe Matthew 25 speaks to me and I pray it speaks to you when you are looking for a cause. ...for I was hungry and you gave me food, I was thirsty and you gave me something to drink, I was a stranger and you welcomed me, I was naked and you gave me clothing, I was sick and you took care of me, I was in prison and you visited me. So don't ask why. Simply - Just do it!